Urea was first synthesized in 1828 making it the first organic compound ever synthesized from inorganic materials. Current production methods using ammonia and carbon dioxide as raw materials have been known since the 1860s, but commercial production was not realized until the first quarter of the twentieth century. Today urea fertilizer is the world’s most popular solid form of nitrogen fertilizer. Urea fertilizer most typically is found either in prilled or granular form, with the granular form having preferred storage and handling characteristics. However, both forms are highly susceptible to caking due to urea’s relatively high degree of hygroscopicity and plasticity. Another problem with urea can be dust generation, especially with multiple handling steps and exposure to variations in heat and humidity. Additionally, when blended with other fertilizers, the critical relative humidity of the blend is reduced, potentially creating additional handling challenges. 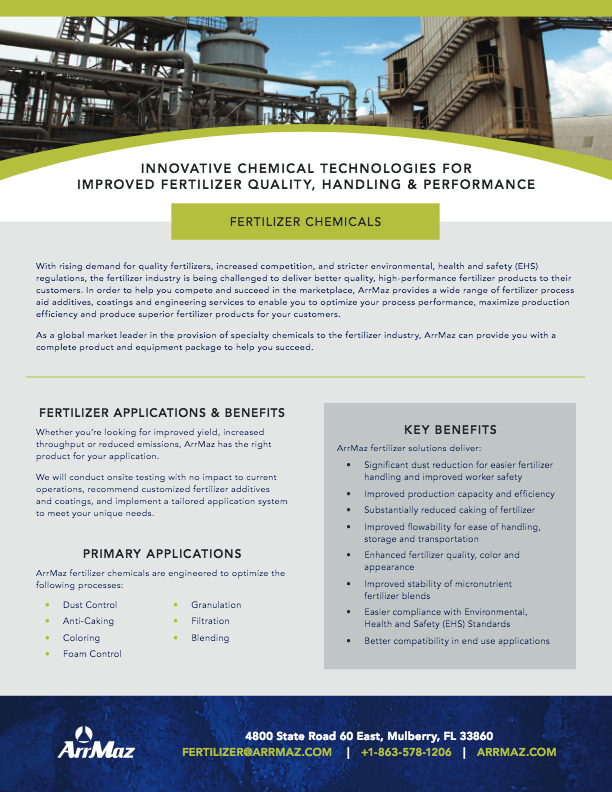 ArrMaz produces coatings in its DUSTROL® and GALORYL® product lines which are specifically designed for treatment of urea, both prilled and granular, and can be customized to address the individual product and process challenges of fertilizer producers and downstream users. ArrMaz coatings minimize dust generation, improving air quality while reducing loss of valuable product. Our coatings also reduce caking of urea fertilizer for improved worker safety and easier product handling in storage and during field application. ArrMaz supplies its urea fertilizer coatings and application systems consultation to any point in the supply chain where additional treatment may be required.